The only way to make it work would be flying out of Southend at 7 a.m. on race day, landing at Amsterdam’s Schiphol Airport at 9:30 a.m., and flying back from Amsterdam to Gatwick at 7:30 a.m. the next morning. And that stupid-early flight meant I wasn’t going to get to hang out at a cool backpacker hostel in the city center—but luckily, I did get to stay at a surprisingly cool airport hotel, just a few minutes’ walk from the terminal. 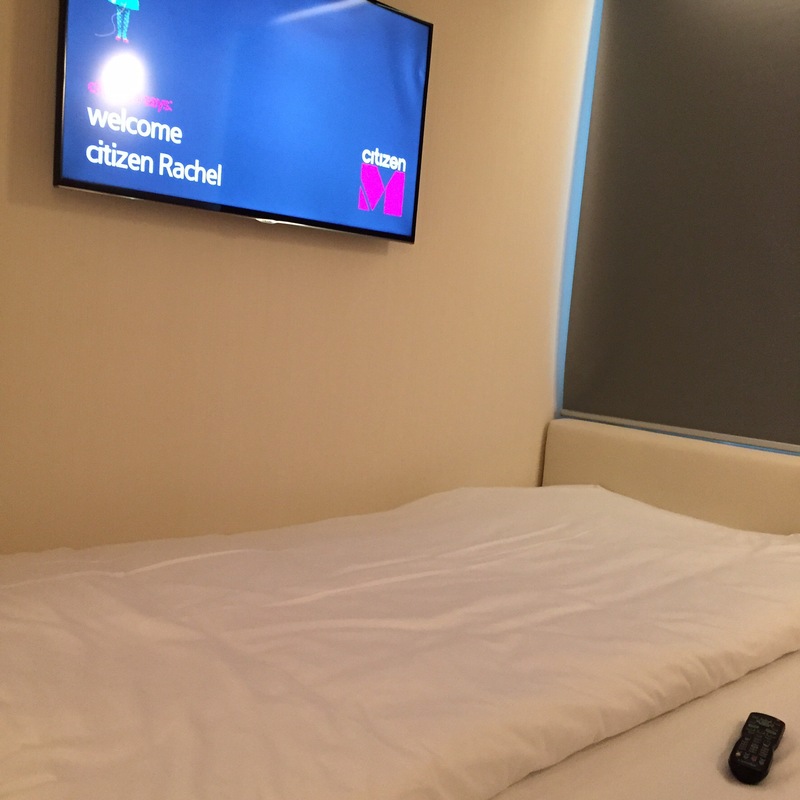 More than almost anywhere else I’ve ever stayed, citizenM felt like it was built for me. It’s high-tech and modern and youthful but still affordable, and it’s perfectly sized for a solo traveler. Though the comfy king-size bed is plenty roomy enough for two, the room is quite compact, and the unique toilet and shower setup takes up a fair bit of the limited space—there’s no separate bathroom. Instead, there’s one glass tube with a wonderful high-pressure rainfall shower (which was exactly what I needed after running 10km through the streets of Amsterdam) and another glass tube with a toilet. As a kid I always wondered what it would be like to go up the tubes in the drive-thru at the bank, and this was probably the closest I’ll get to that experience. Anyway, I thought it was cool, but if you’re traveling in a pair and want anything approaching privacy or a few square feet to yourself, you might disagree. Aside from the futuristic rain shower and incredibly comfy king-size bed, citizenM’s amenities include the “MoodPad,” a tablet that lets you control the whole room—the blackout blinds, the temperature, the lighting, the TV (and free movies! ), and alarms to wake up for your stupid-early, but-really-who-authorized-this, why-did-this-ever-seem-like-a-good-idea flight. Plus, of course, there’s free wifi. And iMacs in the lobby to work or blog or whatever if you, like me, left your own computer behind to avoid paying extra baggage fees on budget airlines. When you arrive, you’ll be welcomed with a little personalized message on your TV. citizenM’s use of technology makes the whole experience from check in to check out easy and efficient—rows of monitors in the lobby let visitors check in painlessly 24 hours a day without the long lines that sometimes plague understaffed front desks. And you don’t need to navigate some special process if you want to check in a bit early (like I did when I arrived in the Netherlands in serious need of a pre-race nap)—you just pay the early check in fee and get assigned a room that’s already been prepared. Another high-tech touch: That RFID key card you get when you check in? You can use it as a luggage tag until your next visit to a citizenM property—and then reuse it for your next room key. Okay, maybe that’s not really high-tech. But it is an interesting idea I haven’t seen elsewhere. And I did hang onto my key—I thoroughly enjoyed my stay at citizenM and will probably return at some point. They’ve got hotels in Glasgow, Rotterdam, London, Paris, and New York as well as Amsterdam, and I’ll definitely consider them on future trips to those cities. But for now, I’m looking forward to spending some time in a villa in Bali—can’t believe I’ll be there in just over two months! That’s a really useful post. Could you send me a link to the hotel’s website. Cheers!